An absolutely vital part of any aquarium set-up is the filter. While it is technically possible to have a healthy aquarium without a filter (Google the Walstad Method for some deep reading), that sort of fish keeping is best left to the Jedi Masters of the aquarium world. In this article, we’re going to look at what a filter actually does, the functions they perform, how they actually work, and then discuss the different options available. We’ll look at each one individually, go over the pros and cons, and give our own opinions and experiences. What Does A Fish Tank Filter Actually DO? Does The Filter Media Need To Be Replaced? Any Other Kinds Of Filter You Should Know About? So What’s All The Fuss About Activated Charcoal? Do You Need It? So Why Would You Want Charcoal in Your Tank, Anyway? 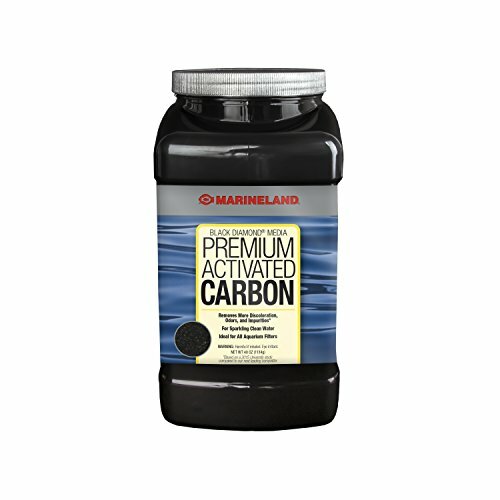 Our Advice on Activated Carbon? It might seem like a silly question, but there is more going on in there than some people realize. Mechanical filtration is the process of removing ‘little bits of stuff’ from the water. Debris, fish waste, uneaten food, anything that’s floating around that you don’t want to see. Many of these things will later rot and create Ammonia, but for now it’s simply removing this unsightly stuff from the water column and trapping it in the filter. It’s important to clean out the mechanical media, as you don’t want all that gunk lingering around. It will eventually decompose and pollute the water once again. Regular cleaning will remove the debris from the system entirely. 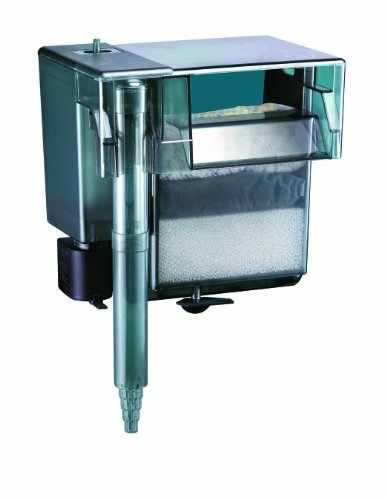 Mechanical filtration media should be the first thing the water passes through in the filter. It will strain out most of the gunk to allow cleaner water to pass through the rest of the system. 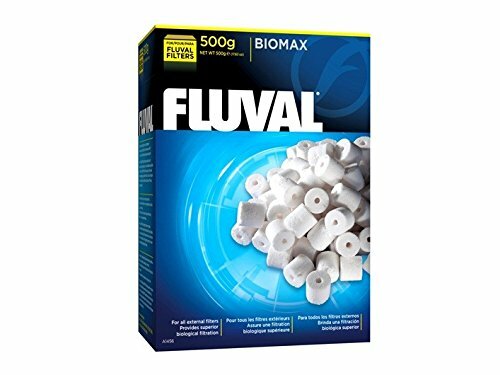 As discussed in our article on Cycling a Tank, filter media provides a home for the millions of beneficial bacteria you want growing in your tank. The point of biological filter media is simply to provide as much surface area as possible for the bacteria to cling to, having as large a surface area to size ratio as possible. The more happy bacteria the water passes by, the more ammonia and nitrites they can convert to nitrates. This is arguably the most important part of any filtration setup, and the part you should be most concerned about. Chemical filtration is the use of certain compounds in your filter to remove harmful chemicals from the water beyond ammonia and nitrites, by way of absorption and adsorption. Absorption: is where atoms or molecules of a substance are literally soaked up by and into the bulk, internal volume of a filter media. Adsorption: is when atoms or molecules of a substance bind to sites only at the surface of a filter media. The process only occurs at the surface, not in the bulk of the media. This results in a thin film developing (adsorbate) on the surface and once the entire surface area is covered, this process stops. The most common compound for chemical filtration is activated charcoal. However, the necessity and importance of using activated charcoal is a matter of great debate in the aquarium word. Activated charcoal is extremely useful and necessary to have on hand for removing medications from the water after tackling a disease or parasitic outbreak. In our discussions on filters, you will hear us mention rinsing out the media in tank water. NEVER USE TAP WATER TO CLEAN YOUR FILTER MEDIA! Always rinse your media out in a bucket of tank water you pulled during a water change. Simply swish it around in the bucket and give it a few good squeezes. Then enjoy the brown color the bucket water will become. Then remember and be happy that all that gunk isn’t in your tank! Many filters will come with instructions recommending you to replace the media every few months. While this helps the manufacturer sell more media, it will only hurt your tank. If you throw away the media, you are removing the vast majority of the beneficial bacteria in your tank! This can cause your cycle to crash and might kill your fish. Simply rinse the media out as discussed above. Now of course, nothing can last forever and eventually your filter sponges, floss or pads may be so ragged and worn that they must be replaced, but don’t do so until then. We have sponges and ceramics that have been running in our tanks for over three years now, and they work just fine. As previously mentioned there is a wide variety of filter types available. We’ll now go over the main four, discuss how they work and give a few of the pros and cons. Many consider the canister filter to be the top of the line, and it’s certainly a favorite around here. It’s a separate unit that sits below or beside the tank. There is an input and output hose. It creates a siphon to draw water into the canister, then pumps it back up into the tank. 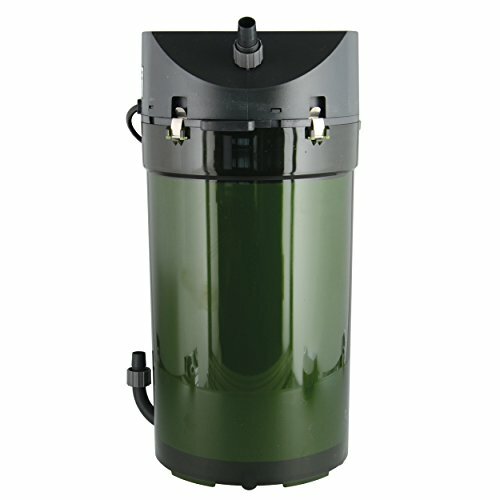 Canisters provide a far superior quality of mechanical filtration than any other type of filter. The water is pressurized and forced through the media, scrubbing out much more debris than would otherwise be possible. They also tend to be much larger than a HOB, which means far more media can be housed and more bacteria can grow. As with a HOB, the canister filter allows you to customize the media inside to your own preferences. Most canisters also let you adjust the outflow, allowing you to ensure it’s not too much for your fancy goldfish or betta. Generally, canisters come with valves to close off the hoses so they can easily be detached, allowing the entire unit to be lifted into a bucket or sink for cleaning while leaving the hoses in place. The positioning of the hoses allows for design options a HOB or sponge filter won’t. We like to put the intake and outflow hoses on opposite ends of the tank to help ensure maximum water circulation and no “dead spots” in the water column. As with the HOB, depending on the species you keep, we recommend a sponge pre-filter be placed over the intake tube if you have any weak swimmers or fish with delicate fins. There are many options of canisters filters available. The top of the line can be computer programmed to monitor your water conditions, temperature, and all kinds of things. We prefer to keep it simple with the Eheim ECCO series.Mostly because they are easy to maintain and work with. Any canister will have a number of moving parts that can break or wear out and as the most expensive filter option on the list, a broken component can be extremely frustrating. We have found that Eheim’s are extremely well built and reliable, meaning this is rarely something to worry about. But if something does go wrong, their website makes ordering replacement parts easy and affordable, as well as all parts being readily available on Amazon. After cleaning and replacing the canister filter, make certain the seals are all on evenly. We once emptied almost five gallons of water onto the carpet overnight by not properly re-seating the lid of the canister. Quite the rude surprise to wake up to! So make sure to seat all seals, assemble the filter and watch it run for a couple of minutes to make sure it isn’t leaking, then check back a short time later to be sure there are no leaks. And as a precautionary measure, permanently site it on an old towel or two – Just in case . Known both as a Power filter or as a Hang-On-Back (HOB) filter, this thing does what the name implies. It is a plastic box that hangs on the back of the tank. It has an intake tube and an electric propeller to draw water up into the box. The water is pushed through the sponge media and spills back out into the tank. This is probably the most popular type of filter currently, for a number of reasons. It is a self-contained system and does not add to the footprint of the tank. 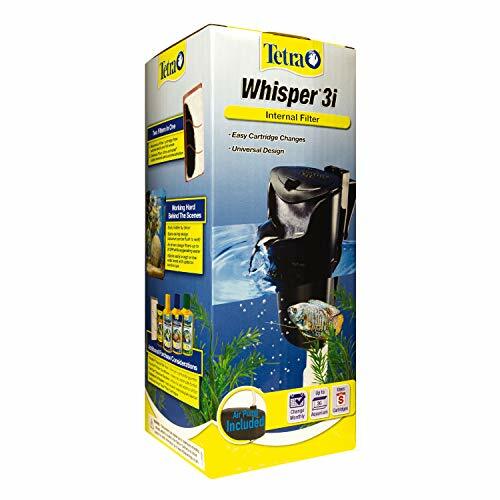 It provides excellent biological filtration, as well as good mechanical and chemical filtration. The waterfall effect creates a lot of surface agitation, keeping the water oxygenated nicely and often eliminating the need for an air stone. There are a large number of brands available. Many of these come with pre-made cartridges that slide into a slot in the back. We prefer the kind with a “media basket” like the AquaClear series. This allows you to mix and match your preferred media, rather than being bound by what the manufacturer thinks is best for your tank. The drawbacks of a HOB are they have limited space for filter media compared to canister types, so aren’t the best for larger tanks with high bio-loads. They also have a limited flow rate and emit a more audible ‘hum’ from the motors when compared to a canister filter, so are a little noisier. But the lower price makes up for this and in our experience, over time you soon blank out and no longer notice the hum from the motor. If you plan to use a HOB for your Betta tank, make sure the outflow isn’t too strong for the little guy. It catches their fins which act like sails in currents. Many of them are adjustable, so check before you buy it. We also recommend a sponge pre-filter to go over the intake tube. This will prevent their beautiful fins from being sucked in, as well as provide extra biological and mechanical filtration. This is the simplest and most basic kind of filter, also sometimes described as a ‘bubble up’ type. They use an external air pump (sold separately) to force air bubbles up through the middle of the filter. This causes water to rise, drawing up through the sponge media and leaving out the top. Sponge filters are almost exclusively biological filtration. They will draw some detritus into them, and an old sponge filter can get pretty gross looking. But the primary function is to give the beneficial bacteria somewhere to go. The benefits of this type are they’re simple and easy. 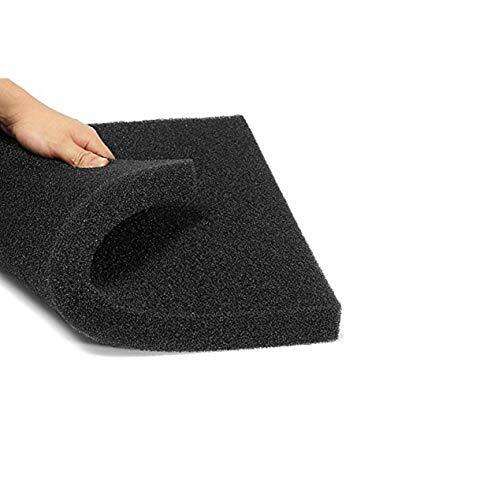 They have no moving parts to break, they can’t spill onto your floor, and the maintenance is a no-brainer. You can simply remove the whole unit and squeeze it out in a bucket of tank water. They also don’t have any kind of intake tube, so fish cannot get caught in them. For this reason they are popular in fry tanks and hospital tanks. They are also good for bettas, as their long flowing fins cannot get caught in it. The rising bubbles from the sponge filter also have the same oxygenation effect of an air stone, serving double duty. The drawbacks of this type of filter are they do a minimal job of mechanical filtration, and zero chemical filtration. While fine for a small tank with a betta in it, a sponge filter would never be enough for a large goldfish tank. A sponge filter will also take up space in your tank. Many people are put off by the look of the thing sitting in the corner, and prefer to get the filtration hidden behind or below the aquarium. 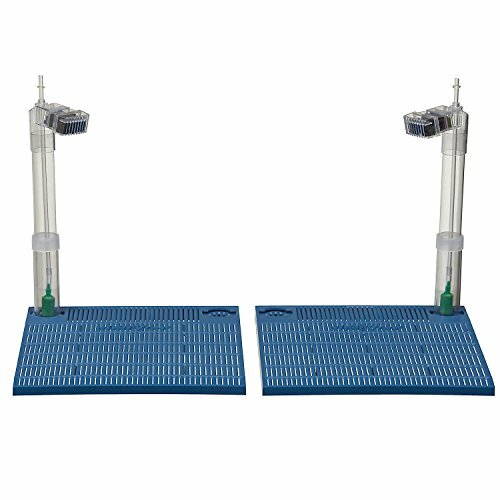 How do under gravel filters work? They do exactly as they sound: They sit under the gravel, drawing water down through the substrate and back out through a tube to provide biological filtration. They use the substrate itself as media, and don’t provide any kind of mechanical or chemical filtration. This is a fairly outdated filtration method. Plenty of people still use them and love them, but they are probably the highest maintenance of any of the filters listed here. Simply put, we do not recommend under-gravel filters. Many people have been using them for decades, but they are slowly falling farther out of favor in the aquarium world. There are other types of filters available, but they all get into the “Advanced Fish Keeping” world. For instance, diatom filters for really ‘polishing’ the water and removing the tiniest of solid particulates, or wet / dry sump filters that are generally used in much larger tanks or saltwater tanks. Many filters come set up with a packet of activated charcoal. Some HOBs, power and canister filters have it already mixed into the cartridge inserts the manufacturer provides (one reason why we don’t prefer that style of HOB and prefer the AquaClear series). Activated charcoal is extremely good at filtering out toxins and unwanted chemicals. This is what your Brita filter for purifying drinking water is largely made of. Having activated charcoal in your aquarium filter can help remove chemicals from your water, if those chemicals happen to be present. The main thing it removes are tannins (the brown tea-like color in the water from driftwood), medications you may have been using, and chlorine and chloramines. Removing medication is a big use. If you’ve had sick fish, you may have been dosing your tank with meds. Once the meds are no longer needed, you’ll want to pull them out of the water ASAP. This is the best use of activated charcoal. Just be sure that you DON’T have that activated charcoal in your filter whenever you are medicating, or the fish won’t benefit from the meds. Activated charcoal can help remove chlorine and choramines, but hopefully you’ve already taken care of that by adding dechlorinator to the water while doing a water change. Right? Water conditioners are easy and convenient to use for this purpose while being far safer and more efficient. Adding chlorinated water to your tank and waiting for it to pass through the filter to be treated means your fish will be swimming in chlorine and it will kill a good portion – if not all – of the friendly bacteria in your tank, breaking the cycle, before the carbon can deal with it. Also, you can never be sure when the carbon has been used up and is no longer effective. There’s a bit of guess work involved, so you will have to replace it more frequently than you should, just to be safe. An unnecessary expense but if you get it wrong, the chlorinated water will sit in your tank, killing off your bacteria colonies and maybe even your fish. It should be noted that activated charcoal does NOT remove ammonia or nitrites, so using it will not reduce the need for biological filtration and regular water changes. For good or ill, activated charcoal will be ‘used up’ in a month or two and need to be replaced so it does become expensive. Also, it doesn’t do much above and beyond the combination of what normal filter media and pre-treating water before adding to your tank achieves. Having it in your filter won’t harm anything, and it might have some benefit. So if you want to be extra vigilant in providing chemical free water for your fish, then go for it. However, we prefer to use that space in the filter for more mechanical and biological filtration, but keep some charcoal handy if it’s needed after medicating. There are many different types and styles of filter to choose from, each with their own strengths and weaknesses. So what do we recommend? It all depends on your budget, the species you’re keeping and the bio-load in your tank. If you’re keeping a tank over 55 gallons, we’d always recommend going with a canister type. If you have a 5 gallon betta tank, a small sponge filter will work just fine. For aquarium sizes in between, either a HOB (or two) or a canister type will suffice. Regardless of what you choose, make sure you rinse the media regularly, and keep up on those regular water changes.